Caution: After you have paid, it may take a week until the payment information is updated on the WEB. Payment should be made from your page (My Page) on the USE website after obtaining your account. The presenting author is requested to pay the presenter registration fee together with the registration fee. Please note: If the payment of the presenting author is not completed by September 26, our committee will have to cancel your presentation. Payments by credit card should be made before Friday, October 14. 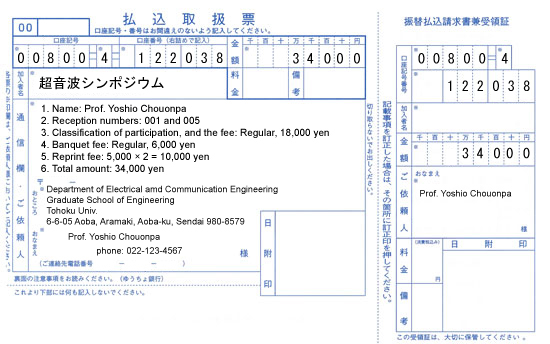 After Friday, October 14, 2011, the registration fee increases by 2,000 Yen for regular participants and by 1,000 Yen for students. Credit card payment will be carried out at the SSL website of the NTT DATA CUBIT CORPRATION. After on-line payment, confirmation will be sent automatically by e-mail for security reasons. If you live in Japan, we would like you to pay by postal transfer. (1) Who only attends the IEEE Distinguished Lecturer presentation (Invited talk 2, co-sponsored by IEEE UFFC Japan Chapter) is free from registration fee. (2) This fee covers participation in the scientific sessions, conference file, book of proceedings, final program, JJAP Special Issue*, and coffee breaks. (3) This fee covers participation in the scientific sessions, conference file, book of proceedings and final program (it does not include the JJAP Special Issue, and coffee breaks) . (4) Retired professor without present affiliation. (5) At Yamauchi hall, 2nd floor, Shiran kaikan, Kyoto University. We are unable to refund cancellations after the payment procedure has been completed. Please send an e-mail to the following address. If you don't have a prescribed form, please use a general form that can be obtained at a post office. Please inform us of the following information for registration with your address and phone number by completing the form as shown above. Classification of participation (Regular, Regular with subscription to JJAP, or Student), and the fee.